Learn How You Can Manage Your Time Effectively and Add Great Value to Your Article Writing Efforts! Rather than being disappointed, spend your energy getting fired up about what you can do! Don’t worry about feasibility or circumstances, just consider something you have always wanted to do and set the goal. Example: You want to write 1 article a day. Break down how you can achieve your goal by overcoming obstacles using your strengths. Your strategy will identify obstacles that hinder your productivity, and more importantly, your strengths that will lead you to achieving your goal. The larger the goal, the more strategies you will want to implement, but the important key is to learn how you can use your strengths to turn weaknesses into opportunities. Example: Let’s say you compulsively check your email. Your strategy would be to set aside time to check your email before you begin the task you intend to achieve. This helps you eliminate the distraction of your email before you begin writing your article. So you like playing Angry Birds. No problem. Schedule it. Employ the 1:2 ratio to keep yourself honest and your schedule balanced. For every X amount of non-productive time you spend, spend 2X’s on your article writing efforts. Example: If you schedule 20 minutes playing Angry Birds, spend at least 40 minutes on your article writing efforts. To help you stay on track, add key milestones to your schedule to help you stay focused on your ultimate goal. Milestone: Title and Outline Complete. Milestone: Proofed First Draft/Second Draft Complete. Milestone: Draft Submitted to EzineArticles! Use these tips to build your article library and your credibility. Remember that old phrase: Rome wasn’t built in a day. It takes 21 days to make a process habitual, so tweak your schedule, pinpoint those distractions and use your strengths to overcome them to persevere. What methods do you use to manage your article writing time and keep you focused? Share your answers in the Comments section below! Do You find this to be a good product? I agree, I don’t experience days like described above and I don’t like to be associated with lolling around. I don’t think it is a good entry to the article. The distractions can be so unbelievably overwhelming. I tried to use a time budget and it worked for a bit but there is something missing. I like the idea of breaking my article writing into segments as mentioned above – excellent idea. Good tips! But what about the distractions of having a baby around? I guess I can schedule the writing during her nap time. Excellent article and one I’m sure we can all relate to! Hope it helps your readers as much as it helped mine. I normally follow a pretty similar process to yours Penny. I identify my goal by writing a list of what I can realistically get done in the day. If I have 1 of those days and start succumbing to distractions I then try to get a bit more proactive by scheduling in mini-rewards e.g. if you finish this article by 1pm you can have a break and watch 1 episode of this TV show as a reward. This works for me most of the time but there is the odd day where I just cannot get my mind in gear no matter what. When this happens I generally just accept it, try to hit the sack early and have an extra productive day the following day. Thanks for your tips. I’ll be honest, I get distracted with facebook and emails, and before I know it I’ve spent an hour doing nothing. I shall put into practice your ideas and create an Action Plan. You were describing me also, Penny. At least, sometimes. 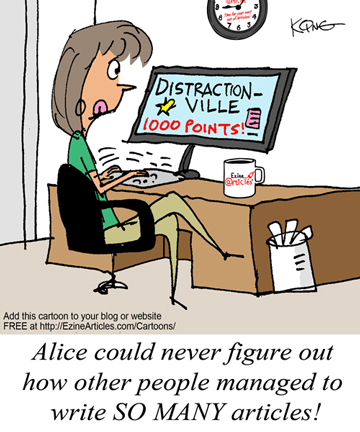 I have to admit I can get so easily distracted by the urgent (e-mails, phone calls, unplanned errands, etc. ), that I tend to forget the essentials. Late at night, I go to bed with the nagging feeling of knowing that I left some important things undone. Your ideas seem to be practical and easy to implement. It will require a lot of discipline to follow through with your advise, but I know I need to do it in order to be effective. Part of that effectiveness has to do with being able to write articles in a regular and consistent manner. I agree with the above comments. We all get distracted. Me too. Sometimes, I think, especially me. 1.I love my written lists. They sit there at my elbow. 2. They are, of course , SMART. Because you all know that that stand for specific, measurable, achievable,realistic and time-framed, I won’t say so. 3.Chunking – I do one small step towards my goal. I’m not fussy about step size. Even checking the spelling of a word counts. It may lead places. 4. Setting a writing time beyond which I AM NOT ALLOWED GO. Usually, I forget and keep on working once I’ve got into swing of things. 5. Reading inspirational articles and responses like those on this site. I suffer neither from distractions nor from writer’s block. 1. Set a simple goal, like 1000 words a day. 3. Have enough research material ready for writing several articles. 4. Listen to your inner voice: What do you feel about writing the most today? This really is a very rare topic. I keep focused and on track by constantly looking at my new Range Rover brochure! I am finding difficult as my articles are not getting accepted for publishing. Can anyone advise me a better way to put things in order? Just contact our Member Support Team by clicking on the “Contact” link in the upper right corner of your Member interface. They’ll be able to tell you specifically why your articles aren’t being accepted for publication. They’ll also be able to help you put things in order. Time is on your side when it comes to marketing – your efforts will still keep on adding up but if you want immediate results perhaps making more time for writing is the answer. My tip is consume yourself in to a writing mode for a a full day per week and put off everything else that needs doing that day. This is the way I manage to get my articles done and ready for publication. Whatever is not done on that day I revisit during the week to finish up what has been started that week thereby giving me time to think of new ideas for next weeks articles. Once in a while I have to skip a week but that gives me more time for beefing up my website and making it more compelling for people to read and revisit. I wish I could wrtie articles with standard English. My mother tongue is not English, so I am afraid of writing articles. This is so true. There are always distractions whenever I sit down to write. The only way I can get some work done is I unplug the internet and write.